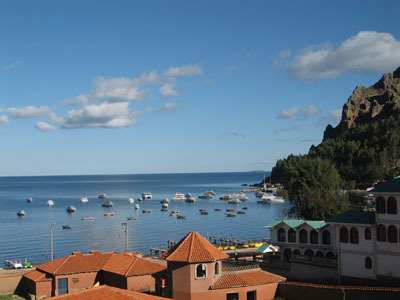 Copacabana lies on a peninsula into Lake Titicaca some 158 kilometers from La Paz at 3,840 meters of altitude. 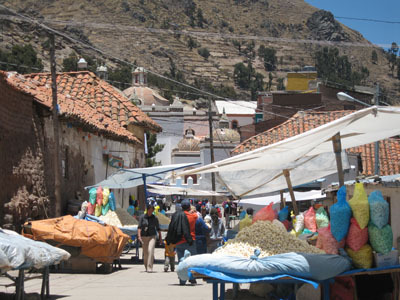 This town for many is the very epicenter of the mystical region that gave rise to the largest South American empires such as the Tiwanakotans and Incas. 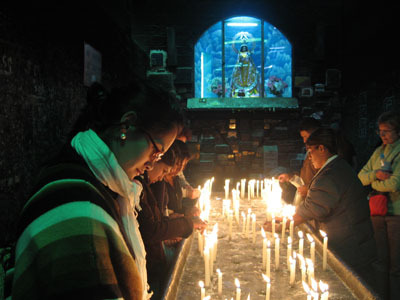 Today Copacabana continues to be a popular pilgrimage site for Bolivian and Peruvian Catholics and believers in the Andean Cosmovisión alike. This syncretism of beliefs is embodied in the sacred “Virgen Morena”, a 500 year old wooden statue of the virgen Mary in the Basilica of Copacabana. The faithful flock to this sacred site for both catholic mass and the tradition ch’alla indigenous blessing. Near to Copacabana lie numerous pre-Incan ruins such as Baño del Inca, the Intikala, and the mis-named “Horca del Inca” (Horca means gallows), however this incredible site is actually a complex calendrical stone that the marauding Spaniards could only imagine as a gallows. 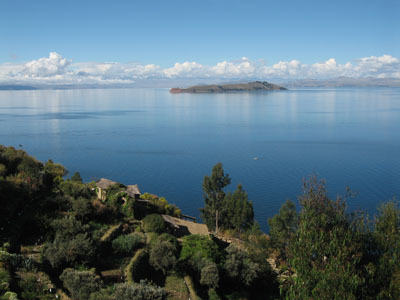 The nearby islands of the Sun and Moon house vast temple complexes and feature prominently in Incan and Andean cosmovisión. 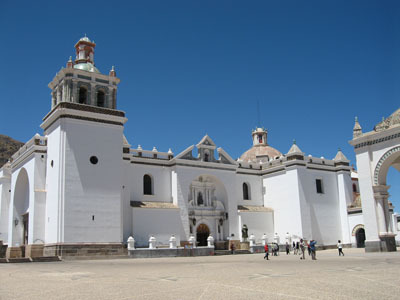 This is a large colonial church with both rennaissance and arabesque elements. It was finished in 1640 and has a cross shaped vault with a cupola in the center. The main door is supported by doric columns. The atrium has 5 minor cupulas and is surrounded by a wall. This fascinating design is painted bright white and the cupolas are covered with blue tiles on the outside. In the interior the venerated Virgen Morena is featured high up on the altar. The statue was made in 1592 by Tito Yupanqui, grandson of the famous Incan ruler Tupac Yupanqui. Inside also lies an interesting museum dedicated to church artifacts and the Virgen Morena’s vestments. This delightful hill is located just to the northeast of Copacabana, a strenuous 30 minute climb up from the town that passes the 14 stations of the cross before arriving at the top with panoramic views of the lake and surrounding mountains. Indigenous shamans perform various blessing ceremonies at altars about halfway up. This impressive array of seats and steps are carved into living rock on the outskirts of the town, a 5 minute walk from the center near the road to La Paz. Nobody knows when it was made or what it was really for. This famous pre-Hispanic archeological site lies near the top of the Kesanani hill some 500 meters southwest of the town. The observatory consists of three enormous stones; two pillars of 25 feet in height with a cross piece on top used to measure and predict eclipses and other calendrical events. This site demonstrates the existence of highly sophisticated cultures like the Tiwanakotas thousands of years before the arrival of the Spanish invaders. This large Incan hydrological complex is located at a lovely 2km walk along country paths towards Sampaya from the town center. With a surface of 8 hectares this place may have been a garden palace for Incan royalty. The original Incan plumbing and piping still works, bringing fresh water into a beautiful round fountain called “El Baño del Inca”. There is a dark museum on site that the caretaker can unlock and the site is surrounded by large eucalyptus trees and fields of crops. 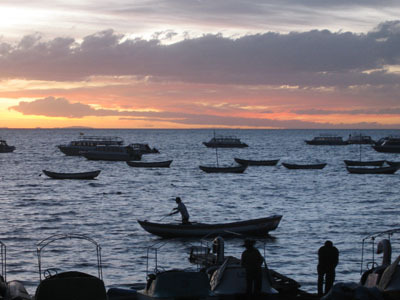 Near the northern tip of the Copacabana Península lies this incredible stone town of Sampaya that has been continually inhabited for over 1000 years. The houses are exclusively made from stone with thatch roofs. The streets are all paved in stone with elaborate stone gutters and canals that guide water through the nearby agricultural terraces. There are also many small trees with the kantuta, the national flower of Bolivia. 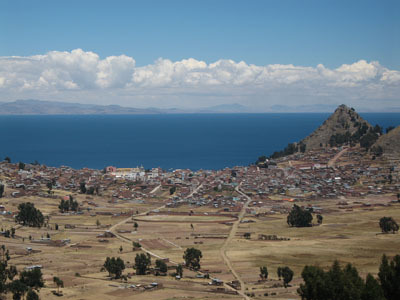 From the town one can look out across Lake Titicaca to the Isla de la Luna (Moon Island) and from above the town to the Isla del Sol (Sun Island). In the distance the snow capped Andean peaks loom above the lake. 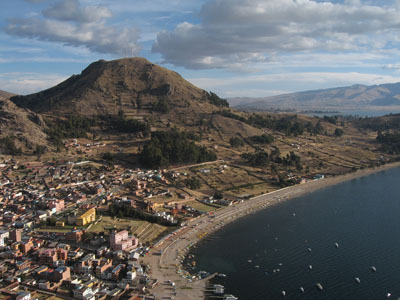 The island was deeply sacred to the Incan and Tiwanakota empire spanning almost 3,000 years. Particularly notable at the ancient palace and temple complexes that dot the island. 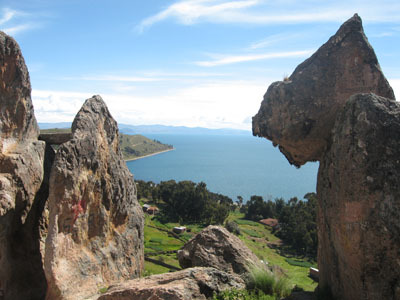 Near the largest town, Yumani, lies the Pilkokaina or Sun Palace that was an Incan residence on this sacred island. 65 meters of beautiful stone steps lead up to a still functioning Incan fountain with three spouts that when drank from are said to give eternal youth. To the north on the island lies the beautiful sandy beach village of Challapampa, a small museum and the amazing Chinkana temple which served as a pilgrimage site for millennia. Near the Chinkana lies the enormous sacred stone where Incan legend dictates that the sun and moon (Manko Cápac and Mama Ocllo) were born to found the Incan Empire. 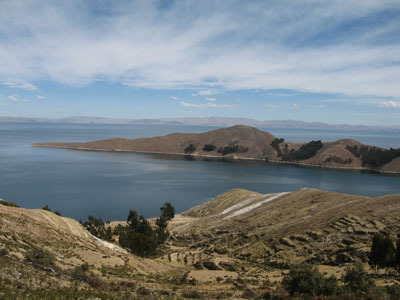 Koati or Isla de la Luna is located just southwest of the Isla del Sol, facing the ancient town of Sampaya on the main land. The island is small and has no source of fresh water besides the lake, but the panoramic views of the Lake and the Cordillera Real mountain range are incredible. There are two small hostals and a fascinating temple complex on the island. 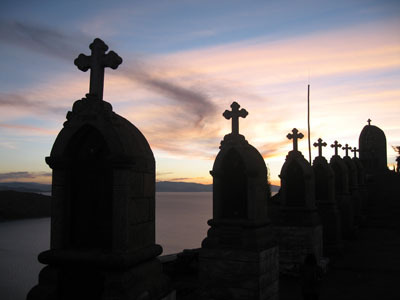 For information about tours to Copacabana and the Titicaca Lake, please visit our tours section.